This ended up as a very bloody game, with very few units left by the end of the game. I played over several days, but probably less than 5 hours in total. It was the first scenario that I have played that was designed by someone else and I can now say that I am quite conversant with the rules. I seldom had to refer to the book by the 4-5th turn and by the end I seldom needed the QRS sheets. It was fun and I highly can recommend the scenario. To the southwest of the Inn. To the west of the Inn on the other side of the river. To the northwest of the Inn. To the southeast of the Inn. Goodenot's and Mallory's Brigades advance to join battle. What appears to be the main area of engagement, just to the west of the Inn. 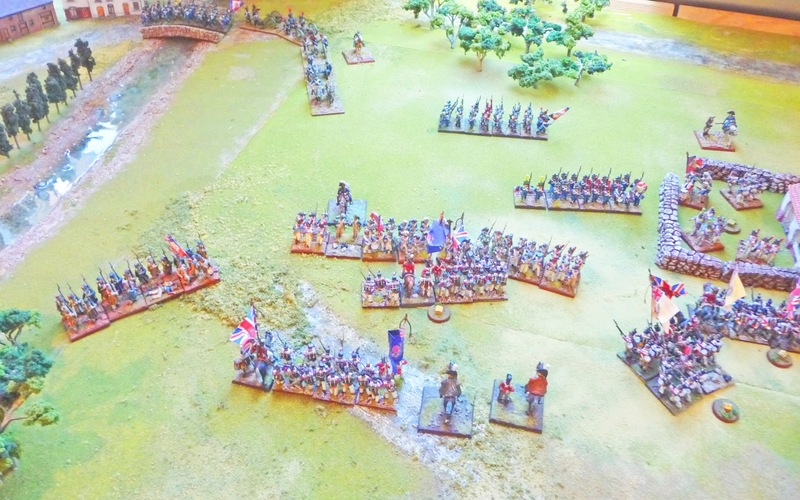 Goodenot has sent divisional artillery and one veteran infantry battalion to the north of the Inn under the control of his commander, Géneral de Division Lorell. 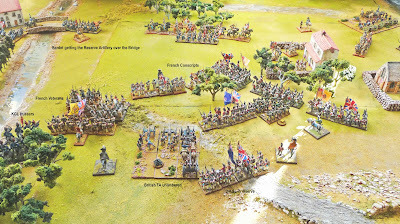 Bardet's brigade advances to the bridge. Lorell has ordered his 2 cavalry brigades to join him post haste. The British and Portuguese advance to the southeast. Lt General Clowes has ordered Shockley's brigade to advance to the south of the Inn while he wants Kirkwood to stay to the east. 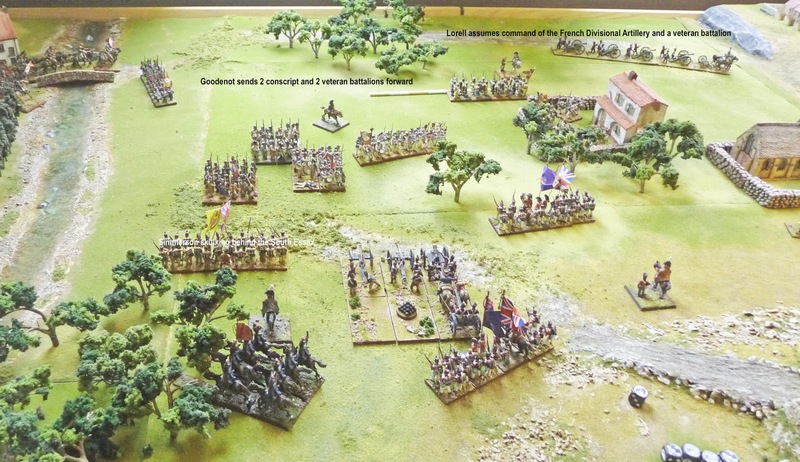 The forces are engaged, with 4 battalions of Goodenot's bde, taking on 2 British brigades. 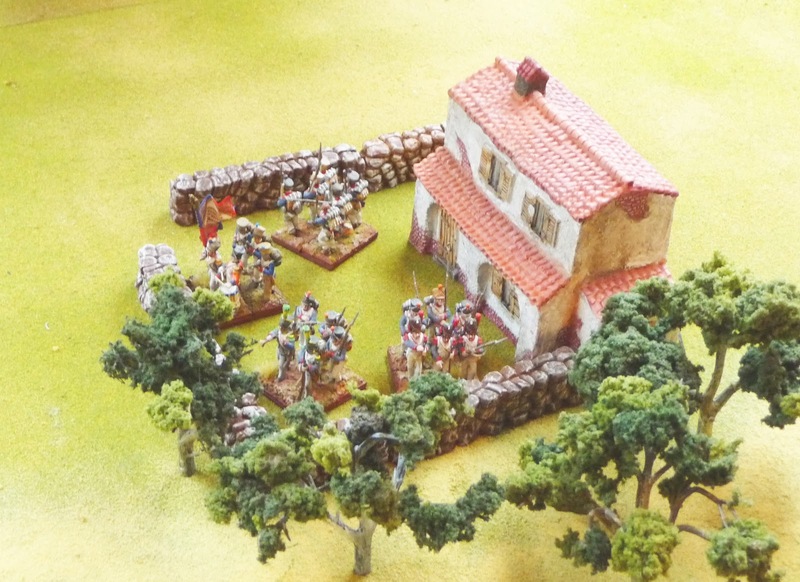 The 26e ligne are sniping from under cover at the flanks of Shockley's bde. Where are the Portuguese FA, rough terrain really holds up artillery trains! 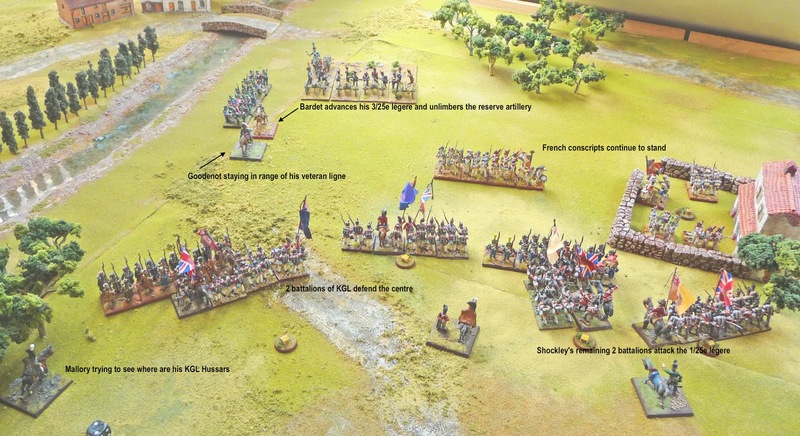 The 1st Caçadores charge the French artillery, they have no refuge! Continued heavy losses all around. The 95th have broken after continued fire from the Inn. 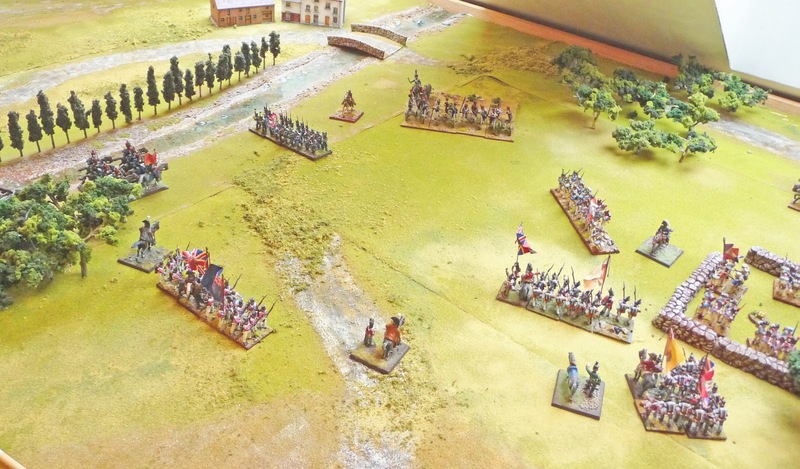 The 2/52nd are broken by the 1/25e légere and the South Essex fail to stand, Simmerson is seen fleeing the field in ignominy. 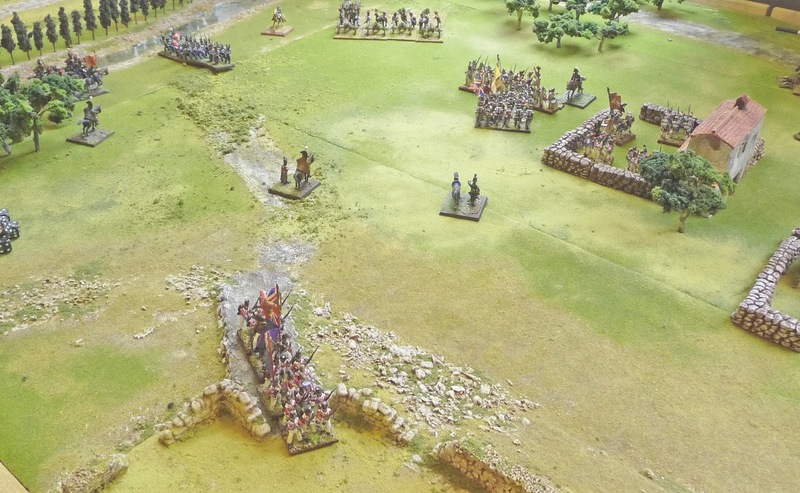 The KGL Hussars have been continually thrown back and have fled to the forest to regroup. The French cavalry have been also quite unsuccessful, and just can not defeat the Portuguese foot and horse. 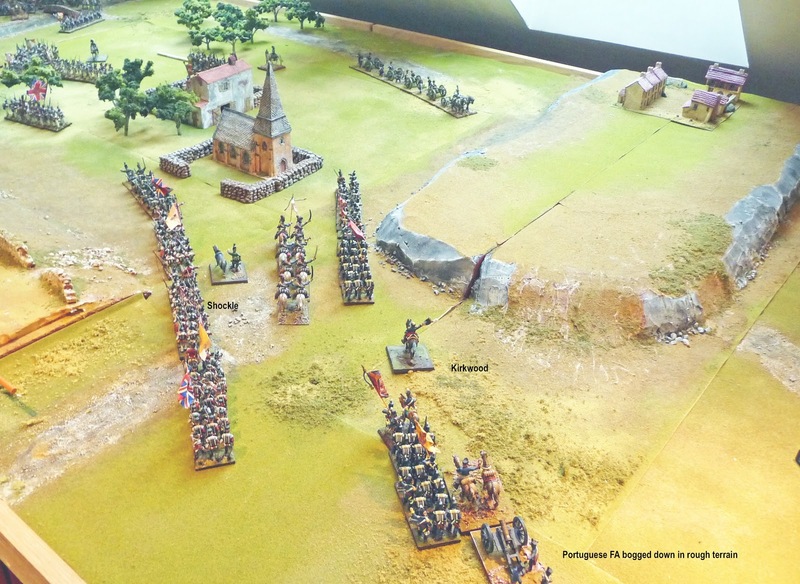 The 9th Portuguese line ascends the hill. Finally the Portuguese FA get through the rough terrain. 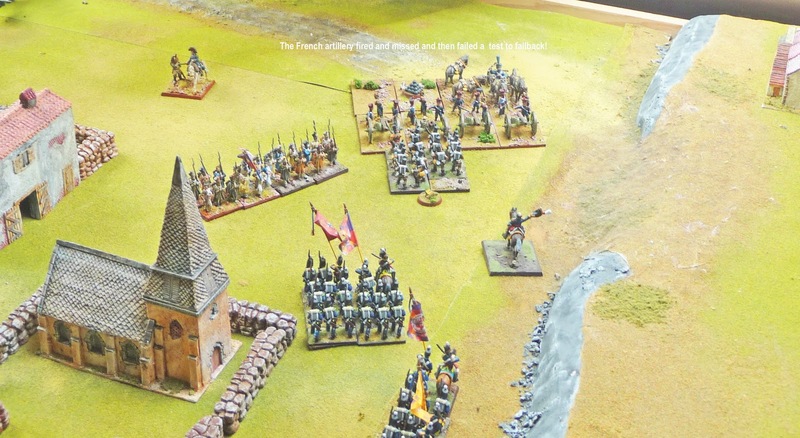 The French cavalry continue their attacks, but are continuously repulsed. Bardet gets the reserve artillery unlimbered, Clowes defensive front is weakening. Now approaching turn 13, scenario allows for 14 turns, both commander need to think about Victory Points, and the British are rapidly approaching a Morale Check because of their losses. Lorell pulls back is cavalry in an attempt to rally them, repeated charges have decimated their ranks. The légere make an attempt to decimate the caçadores. Kirkwood has gained the hill to the east of the Inn, he sends the 8th Portuguese foot to take the church. 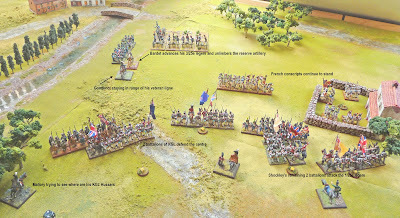 The British defensive lines are decimated, the KGL Hussars finally attempt a charge, perhaps to late. 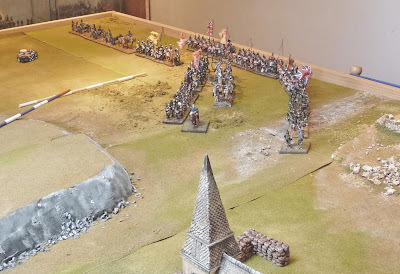 Clowes has lost the 2/52 and both the 1/52 and the 71st have 3 DISR each, he decides to pull back the remaining KGL infantry and secure the hill south of the Inn before nightfall. Goodenot although losing 3 of his veteran battalions and 1 of his conscripts continues to hold the Inn. Clearly his tactical skill and vigorous style have helped. The KGL gain the hill, but the 1/52 and the 1st Caçadores have broken, the British have met their break point. The British have lost 8 of their 11 infantry battalions, 1 of their 2 cavalry regiments and artillery batteries. The French have lost 5 of their 9 infantry battalions and 1 of their 2 artillery batteries. 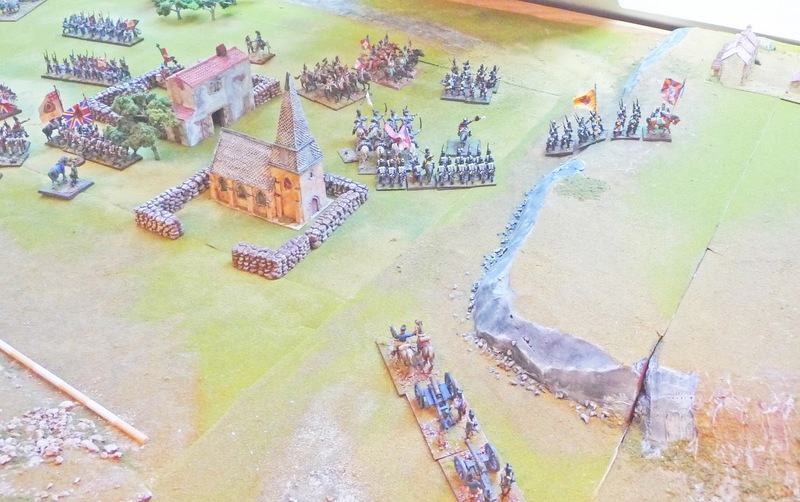 The British hold the southern hill, while the French hold the bridge and the Inn. The eastern hill and the church yard remain disputed. 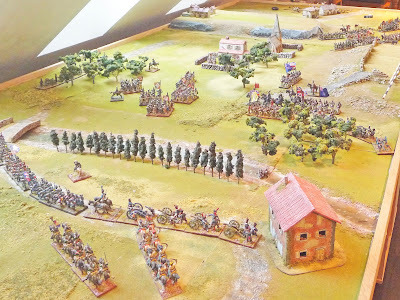 A clear French victory. 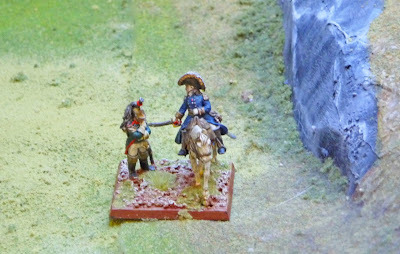 Général de Division Lorell discusses his victory with his ADC. Excellent write up! I enjoyed your AAR and your version of "no Room at the Inn!" 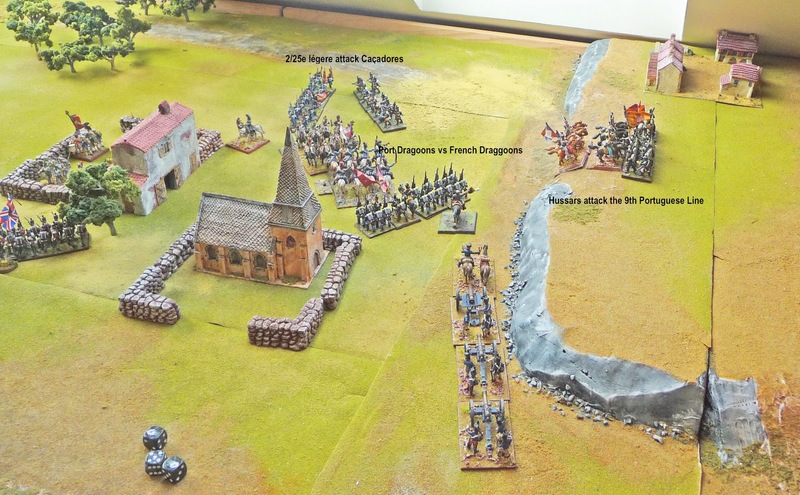 Like your battle report, like your table & scenery and like your figures - great stuff. 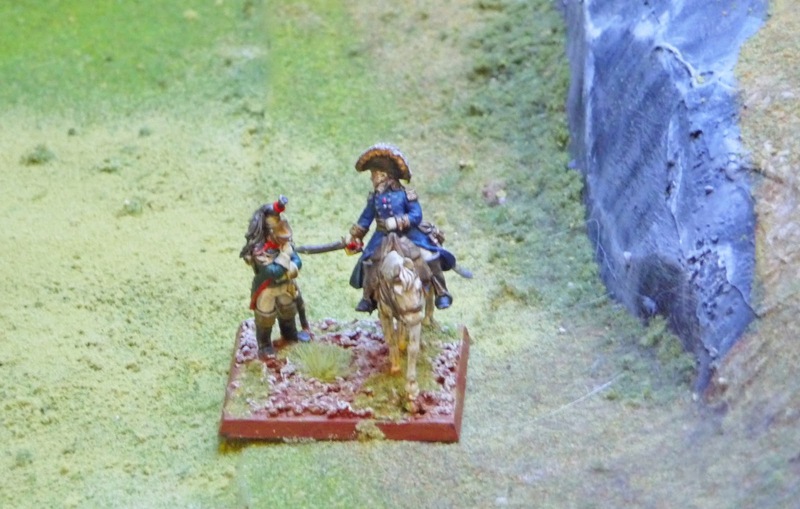 The dragoon officer looks like he could be almost weeping at telling his commander of the Pyrrhic victory - "another one like Mon Chef and I will resign my commission!!" That was an enjoyable read with some excellent pics! I like the way you put labels on the pictures as it really helped me to follow the action. Thanks for posting! Very enjoyable read John, and great pictures of course. The game seemed to flow well and give a realistic outcome. Well described.